Manos : The Hands of Fate is one of the most extraordinary bad movies ever made. It has had a surprisingly long history for a film that, by all accounts, should have been relegated to an El Paso urban legend. In this blog entry, I will identify the most well-known versions of the film and their releases to date. Originally Released : November 15, 1966 at the Capri Theater in El Paso, Texas. The versions that are available are at least two generations from the source material. The film was shot on 16mm color reversal stock, giving a positive (natural) image. From there, a blow up 35mm internegative was created with the soundtrack added, and from it 16mm and 35mm positive release prints were created from the internegative. 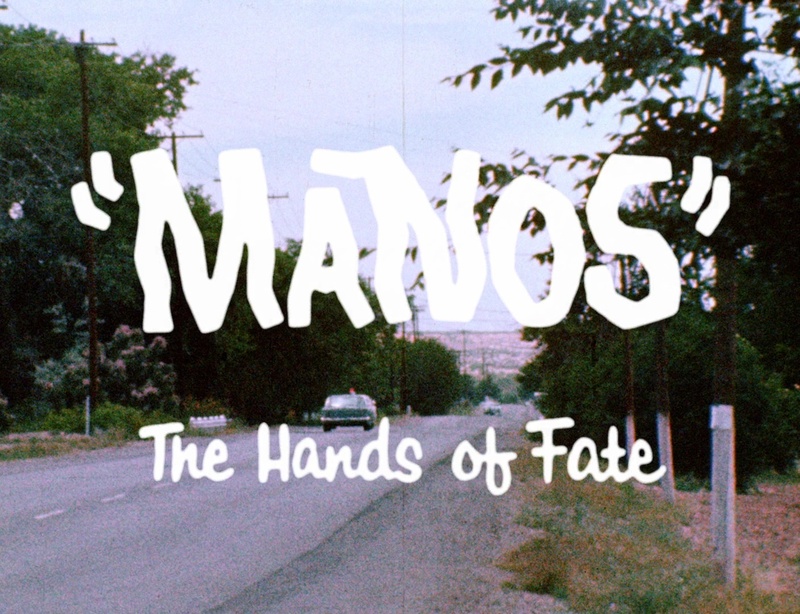 Manos was shot without any sound and used the full area of the 16mm film frame. Full frame 16mm or 35mm has an aspect ratio of 1.33:1, but the academy ratio is 1.37:1, mainly to account for the optical soundtrack on the side and the thicker borders between frames. The resulting camera image had to be cropped to fit within the smaller confines of the academy ratio when the soundtrack was added so it could be played in theaters. The film was edited in four to six hours, which is a very short period of time and allowed mistakes to remain in the picture. Voices were dubbed in later in a studio by Hal Warren, John Reynolds, Tom Neyman and William Bryan Jennings and one unknown female voice actor. There are eight distinct female speaking roles (Margaret, Debbie, the first three of the Masters Wives, the two women at the end, the makeout woman) compared to six male speaking roles (Michael, Torgo, the Master, the two Deputy Sheriffs and the makeout man). 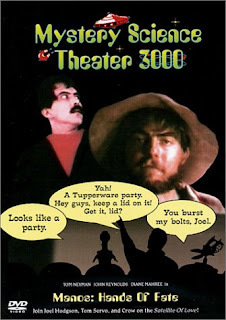 The film was apparently taken from a box of tapes of public domain films and projected on the screen while Joel and the Bots would sit in front and riff on the movie. The quality of the film itself is poor and not helped by the fact that it is being projected from videotape. Of the film, 51:13 appears to be used. The rest of the time is used by the Hired Part 2 short, the host segments and the transitions, commercial breaks and mST3K credits. The riffers here are Joel Hodgson (as Joel Robinson), Trace Beaulieu (as Crow T. Robot) and Kevin Murphy (as Tom Servo). Also appearing in the episode are Trace Beaulieu (as Dr. Clayton Forrester), Frank Conniff (as TV's Frank), Jim Mallon (as Gypsy) and Mike Nelson (as Torgo). The film is taken from Ben Solovey's 16mm print of the original theatrical release, but the color has been restored independently of Solovey. 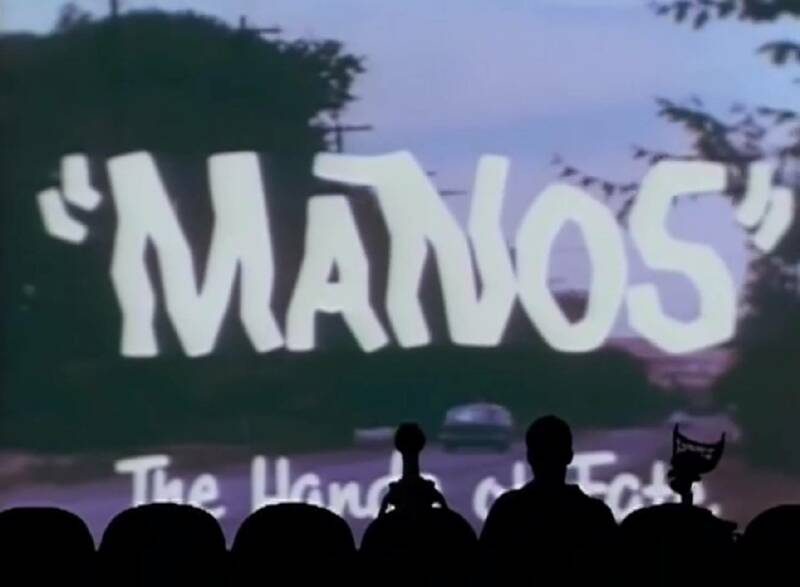 Unlike the MST3K version, the entirety of the film appears to be used for this riff. The riffers here are Mike Nelson, Kevin Murphy (returning to the scene of the cinematic crime) and Bill Corbett. The live event was recorded for posterity. This version combines the 16mm positive camera footage with the optical soundtrack from Solovey's print of the 16mm theatrical release version and a few film clips of the driving sequences which were not included in the workprint film. Quality-wise it will not get any better than this because there are no dupes being used. It is missing the infamous visible clapboard error when the makeout couple are shown for the second time because those frames were not included in the workprint materials in Solovey's possession. There are a few dissolves (the fade out and fade in combinations) in the theatrical release that could not be recreated for the workprint because of a lack of suitable film material on each side of the dissolve. Approximately 14 seconds may have been left out of this version compared to the original theatrical release. 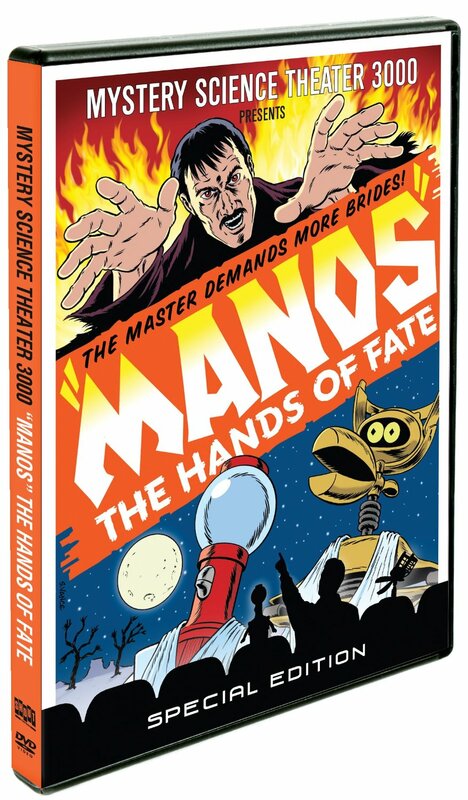 This was one of the first MST3K episodes released on DVD, and in these days Rhino released each episode separately. This release is Out of Print, and has been superseded (except possibly for the hour long outtakes from the making of this episode). This DVD starts with a shot of the family in the car. 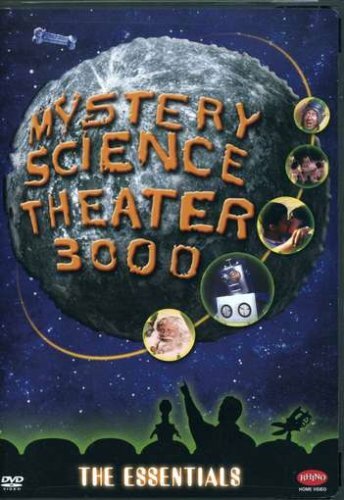 The MST3K version starts a few seconds earlier, but the original theatrical release starts a few seconds still. This release is still in print and representative of the so-called "public domain" releases of the film. Strictly for people on a severely limited budget. This disc has no extras and is out of print. Unfortunately, the MST3K episode of Santa Claus Conquers the Martians is not to be found elsewhere in print on disc. This release comes with two discs and is in print and includes the very informative Hotel Torgo documentary. The documentary features Bernie Rosenblum, who was a crew member on the film and also the male half of the makeout couple. The uncut Original Theatrical Release can be found on the second disc. For the show, the extras and the price, its a very good deal. Extras : Outtakes from film riffed by Mike Nelson, Kevin Murphy and Bill Corbett, DVD only, Extra riffs of shorts "Welcome Back Norman" and At Your Fingertips: Cylinders"
There is not too much to say about this disc that has not been said above. The picture quality on the Workprint version is amazing, and the sound quality is also very good. The featurettes are well-worth the time. If you want the best copy of the unadulterated film around, go for the Synapse releases. Alpha Video's DVD has been totally superseded by Synapse's DVD. The Synapse Blu-ray is superior, so you should obtain if you have a way to watch or rip Blu-rays. As far as the riffed version go, if you are a Joel fan, you should get the MST3K Special Edition, while Mike fans should seek out the Rifftrax' DVD. Alternatively, you can find the MST3K episode on YouTube for free (annotated) and the Rifftrax' version on Hulu. The older MST3K releases likely command high prices because they are out of print. The Sega Master System was not very successful in the United States or Japan, where Sega was unable to overcome Nintendo's massive successes. It was markedly more successful in Europe and especially Brazil. Unfortunately, only 116 games were released in the United States. Quite a few of those games are pretty decent, but there is a lot of crap and uninspired games for the system. There are also quite a few decent games that only came out in Europe. However, for the US only releases, I can still cull 30 games worth playing from the library. Usually I list every game in a series because the gameplay is usually consistent and you can know what to expect, but I will exclude a dud game. I am not including any SMS games that were ports of Genesis games or which have a Genesis version unless the SMS game offers something special. The Genesis is an extremely common system and the first two models have backwards compatiblity with SMS games with an adapter. I tried to include Light Phaser and 3-D Glasses games since these were significant (Light Phaser) or unique (3-D Glasses) peripherals. I also have noted which games have battery backup save RAM, which is a rarity for 8-bit Sega cartridges. Finally, I have also noted which games have an optional FM Synthesis soundtrack. For the games with an asterisk, you will need a hack to play them in anything other than a Japanese system. If you buy a SMS, you will have a built-in game. Early consoles will have a simple snail maze game, later consoles may come with Hang On and Safari Hunt, just Hang On or Missile Defense 3-D. Master System IIs should come with Alex Kidd in Miracle World. There are a couple of games that almost made the list. Ys: The Vanished Omen has FM Synthesis but the game is too slow and difficult compared to the Turbo CD version. King's Quest is interesting but not nearly as good as its PC original. Miracle Warriors: Seal of the Dark Lord is the only other RPG released for the system, but it has nothing to really distinguish itself from a typical JRPG before they became good. Europe got more games than the US did, and some of them are pretty good and will run in a 60Hz NTSC System. Ultima IV: Quest of the Avatar is a superb port of the PC game, much more faithful to the PC source than the NES version and has FM Synthesis music. 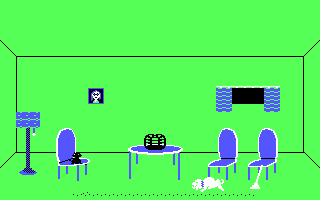 Ninja Gaiden is a passable game if you need an 8-bit Ninja Gaiden fix, but it is not near the NES games. Despite what SMS Power! may contend, Sonic 2 runs without any real issue in an NTSC machine. The Atari 2600 had many classic games as befitting the first really successful home video game console. However, it has a lot of not so classic games and a lot of derivative games. I have devised a list of must have games. The games on this list are generally easy to pick up and play, provide some of the most fun gameplay on the console. Moreover, there are no holy grails on this list. If you want to actually collect the cartridges, as opposed to playing them on a Harmony Cart, none should break the bank. If you are going for a pure cartridge route, note that four of these games will require a Starpath Supercharger. A Supercharger is a very wise investment because almost every game is really good. Moreover, you do not even need the original cassette tapes to play the games. You can run the binary files through a digital to analog program like makewav and output the audio signal from your computer to the Supercharger. There are a lot of direct arcade ports on this list. I have highlighted them in yellow. 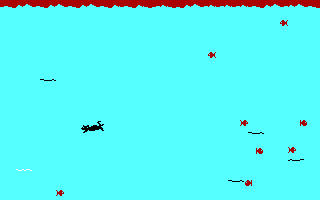 Some of the early 2600 games like Indy 500, Combat and Video Olympics are more of the embodiment of a series of arcade games (the Indy, Tank and Pong series), but I consider them the official home port of these arcade system lines. Some arcade ports like Stargate and The Official Frogger are truly amazing. If you want to obtain the cassette before playing The Official Frogger, the Parker Bros. cartridge is good enough to fill the void. You will note a fair number of paddle games on this list. The paddle controller is the second most used controller for the 2600 and I tried to give a sampling of the best games that support it. Warlords is a great four player game, an essential addition to any 2600 library. Indy 500 uses driving controllers, which are far more precise than paddle controllers and are always responsive. Most of these games are essentially pick up and play, but there are a few exceptions. You will need the manual and overlay for Space Shuttle, which uses every switch on the console. Dragonstomper, the only true RPG for the 2600, requires a read of the manual before sitting down with the game. There are several games, that while not bona fide classics, have such a historical impact or made in such large numbers that they may deserve to be on any list regardless of quality. 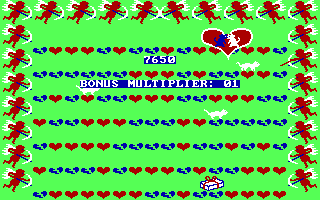 This includes the unholy three of the 2600, Defender, Pac-Man and E.T. the Extra-terrestial. Defender is fairly disappointing compared to Stargate, Pac-Man's reputation is well-known and E.T. status is legendary. However, the first two are pick up and play. E.T. 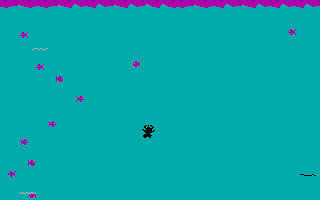 requires reading the manual and avoiding the worst of the bugs (do not stop levitating until every pixel of E.T. has cleared the pit.) Breakout and Star Raiders are OK, but Breakout pales in comparison to Super Breakout and Star Raiders is best played on the Atari 8-bit and 5200 systems. Donkey Kong from Coleco is also extremely common but only has two of the four levels from the arcade and is rather lacking. The Swordquest games are not very fun and the third is rare. But if you really want to explore garbage on the 2600, you could try the adult games available for that system, starting with the execrable Custer's Revenge. With this post, my 257th, one can no longer number the number of blog entries on this blog in an 8-bit number! A digital joystick is just four contact switches activated by pressing a directional instead of a button. This includes the Intellivision's controller, which has sixteen discrete positions, and most console "joysticks". An analog control allows for smoother movement instead of relying solely on the amount of time a directional has been pressed. Originally, analog knobs or paddles were used with Pong and other ball and paddle games. Eventually the combination of two of these "paddles" with a common control became a joystick and achieved some popularity for racing and flight simulators. Outside these pigeonholes, most of the popular games of the 70s and 80s used digital joysticks, trackballs and rotary spinners (the latter are used in the Breakout-derived Arkanoid). Only in the mid-90s with the rise of first and third person 3D games did a compelling need for a general analog controller present itself. In the blog post, I will discuss how analog controllers used to be used and how they are used today. True analog controllers in the video game world use variable resistors. The humble variable resistor, also called a potentiometer, has had a wide variety of applications. You will see them at work in light switches, to change volume or temperature. They were often used in video game controllers. There are two ways in which analog control was implemented at the hardware level, and both involve potentiometers. The most common way is to use the potentiometer as a variable resistor in a resistor/capacitor discharge network. In this method, a capacitor is discharged then a port is read until the capacitor indicated it was recharged. The time it took for the capacitor to charge gave the position of the potentiometer. More resistance equals a longer charging time. Only two wires are connected to the potentiometer in this case, one of the end terminals (to +5v) and the middle terminal is connected to the console. The second method is to use the potentiometer as a voltage divider with a comparator. In this method, the potentiometer's output voltage is compared to a voltage ramp, which is reset, and the time it takes for the voltages to become equal indicates the stick's position. In this case, all three terminals of the potentiometer, one end to +5v, one end to GND and the middle terminal gives the signal to the console or computer. The Atari 2600 usually came with a pair of paddle controllers. Each paddle had a potentiometer connected to two terminals, making it function like a variable resistor. Each controller port could support a pair of paddles but only one of any other type of controller. Paddle games were the only official solution for four-player gaming. The output line of these potentiometers is connected to the TIA chip. The rating of these potentiometers is 1MOhm. Each paddle had a single button, which shared the same line as the left or right joystick directional. Button inputs are connected to the 6532 RIOT chip. Interestingly, while not an analog controller the Keypad Controllers and their clones also make use of the potentiometer lines. There are insufficient digital inputs on the 2600 controller port to read a 4x3 matrix. What the 2600 does is to set the joystick inputs as outputs and send a signal through each of the four lines. These correspond to each horizontal row of keypad keys. One column is read via the joystick fire button input on the TIA and the other two columns are read through one of the paddle input lines with the assistance of a 4.7KOhm resistor. The Atari 7800 is backwards compatible with the Atari 2600 and includes a TIA and 6532, but no 7800 games support analog controllers. The Apple II and II+ came with a 16-pin socket which could accept four paddle inputs. These systems came with a pair of paddles with the Apple logo branded on them. Like the Atari paddles, these operate as variable resistors. They use 150KOhm potentiometers. Soon someone figured out that you can pair two paddle inputs to make a joystick input. Unfortunately, there were only three button inputs, making the use of two joysticks rare. Typically a single joystick would only use the first two button inputs. The Apple IIe kept the joystick socket but also added an external DE-9 port containing the lines necessary to support the four analog inputs and three digital inputs. This port uses the same lines at the 16-pin socket, but it is easier to plug in and remove peripherals from the external port than the internal socket. The Apple IIc removed the internal socket and required the joystick to share the port with a mouse, limiting the joystick to two analog and digital inputs. For the IIe and IIc Apple released a joystick and paddles separately that use the DE-9 connector. The Apple IIgs has the capabilities and connectors of the IIe but also supports a fourth digital input for four buttons. The IBM PC uses a DA-15 gameport supporting four axes and four buttons. The Tandy Color Computer and 1000 uses a pair of DIN-6 connectors, each supporting two axes and two buttons. All of these computers use 100KOhm potentiometers, but the IBM standard wires them as variable resistors and the Tandy machines wire them as voltage dividers. Like the Apple II, these interfaces use discrete circuitry instead of a custom chip. Tandy's regular CoCo joystick uses one button and are non-self centering. They are not regarded highly. The Tandy Deluxe Joystick is self-centering, has two buttons and can be set to free-floating mode. The IBM PCjr. joystick has the same features and look identical to the Tandy Deluxe Joystick, but has a different connector and is wired as a variable resistor. Both joysticks hail from Kraft-designed joysticks, which were pretty much the standard for the early to mid 80s for the Apple II and IBM/Tandy. The Apple II usually runs at one speed and unless an accelerator is being used, the constant speed eliminates issues with reading from the joystick port. The VIC-20 has one joystick port, so only one pair of paddles is supported. The paddles are connected to the 6560 VIC chip, which provides video and audio. Because the paddles are wired to the Atari standard, the buttons are handled by one of the 6522 VIA chips. The C64 has two joystick ports, so two pairs of paddles are supported. The paddles are connected to the 6581 SID chip, which also handles the audio for the computer. The SID chip only has two analog potentiometer inputs, so the inputs from two pairs of paddles are multiplexed and read with the assistance of one of the 6526 CIA chips. The CIA chip also handles button reading. Commodore's paddles can be used with either system and they use a resistance value of 470KOhms. Atari 2600 paddles are more common and usually work OK, indicating that Commodore's paddles are wired as variable resistors. The Atari 400 and 800 computers could support four pairs of paddles using its four controller ports. These are connected to the POKEY chip inside the system, which has eight analog input pins. Super Breakout for the Atari 8-bit computers supports eight paddles used in a sequential fashion. POKEY is also used for audio generation and other system functions including scanning the keyboard for pressed keys. The buttons are read by the 6520 PIA chip. The 2600 paddles are used in these computers. The Atari 5200 was noted for being the first system to come with an analog joystick. The Atari 5200's joysticks manipulates a pair of potentiometers (not smaller than those found in paddles) and use a resistance value of 500KOhms. The 4-port system could, as its name implies, support for of these joysticks. The 2-port system could only support two joysticks. No paddles were specifically made for the 5200. There is no PIA chip in the 5200, so the joystick buttons are read by the GTIA chip. The keypad buttons are read similarly to the keyboard keys in the 8-bit machines by the POKEY, but multiplexers are used. The later Atari 8-bit machines, from the 1200XL, 600XL, 800XL, 65XE, 130XE and XE Game System eliminate two of the controller ports, so you can only use two pairs of paddles with these machines. The Vectrex controller may not have had quite as many buttons as the 5200 controller, but four independent fire buttons was a rarity. Its joystick was smaller than the 5200's and apparently less brittle. Also, far more importantly, the joystick is self-centering. The innards of the joystick look very similar to those of the Sony Dual Shocks to come in the following decade. Not only does the Vectrex controllers contain a pair of potentiometers attached directly to the joystick, but there are also a separate pair of trimmer potentiometers located elsewhere on the PCB. Apparently these can be adjusted without opening the joystick and serve to fine tune the joystick's centering, not too dissimilar to how Apple and PC joysticks work. These trimmer potentimeters are 10KOhms. Unlike the Tandy sticks, which have one end terminal of the potentiometer connected to +5v and the other end terminal connected to GND, the Vectrex stick has one end terminal connected to +5v and the other end terminal connected to -5v. The resistance value for these potentiometers also appears to be 10KOhms. Because Vectrex controllers are rare and only two commercial Vectex games use the analog function, Sega Genesis 3-button controllers have been converted to work with them. NES Controllers are primarily digital, they send out a bit for a pressed button. However, the NES and Famicom versions of Arkanoid were released with a paddle controller. This controller, called the VAUS Controller in the US, could be used instead of the gamepad. The Famicom controller plugged into the expansion port and the NES controller plugged into Controller Port 2. The paddle had one button. The NES and Famicom controllers are not compatible with each other, they function identically but use different bits to send their data. No other NES game used its Arkanoid controller, but the Famicom games Chase HQ and Arkanoid 2 could use the Famicom Arkanoid controller. The NES controller has a small screw that could be used to adjust the sensitivity of the controller via a trimpot. The Famicom controller does not have a trimpot. The interior of the Arkanoid controller shows a 556 timer and potentiometer wired only to two terminals. This means that it works just like in the Apple II or IBM PC. Outside the classic consoles, most systems of the third and fourth generation of video games did not support analog controllers. In the fifth generation, things began to change. The Nintendo 64 was released with an "analog" thumbstick, but the thumbstick uses optical sensors and is not really an analog controller for the purposes of this article. The basic principle of how the analog thumbsticks operate on a PlayStation Dual Shock controller is similar to how the Tandy CoCo joysticks work. Although its successors may offer more analog controls, the basic functionality is unchanged. Essentially each thumbstick manipulates a pair of potentiomers, one for each axis of the stick. These potentiometers are wired in the three pin style, making them voltage dividers. When the stick is in the neutral position, the sticks should be outputting half the maximum voltage (2.5V). The controller chip of the controller reads these values and converts them into a digital 8-bit value which is sent with other stick and button information as a multi-byte serial packet to the console. Every PlayStation game that supports the thumbsticks should use a standard routine to calibrate the thumbsticks when the game is bootup. Even with tighter tolerances and more compact form factors, the dead center position may not reflect the midpoint voltage reading. 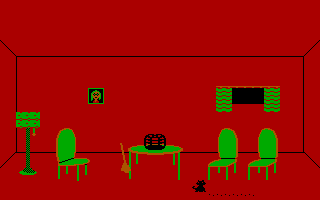 Alley Cat from Synapse Software is one of the best examples of a classic game released for the IBM PC. Originally programmed for the Atari 8-bit computers by Bill Williams in 1983, it was soon ported over for the PC by Williams and published by IBM. Alley Cat is not an overly complex game and is easy to pick up and play. You play as an alley cat named Freddy who is trying to impress his would-be girlfriend Felicia by doing all sorts of alley cat things that people who live in the alley find to be a nuisance. The object of each level is to get into one of the rooms of the condominiums above the alley using the windows that open and then complete the challenge in that room. Once you complete the challenge, Felicia will beckon to you through an open window. There you must dodge her brothers and reach her to get a kiss. Once you kiss her you will advance to the next level, which is more difficult than the last. 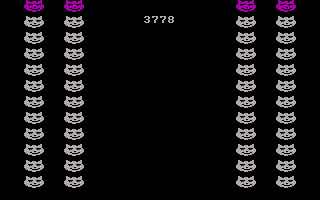 When you start you can select one of four difficulty levels, Kitten (easiest), House Cat, Tomcat or Alley Cat. You can control the game with the cursor keys or a joystick, but I highly recommend using a joystick. Moving Freddy is done by pushing left or right and jumping by pressing up. Pressing down descends off clotheslines, fences and other platforms. Jumping left and right is done with by holding the up and left or right cursor keys or directionals on the joystick. Freddy can cover a lot more distance from a running jump than a walking or stationary jump. The jumping mechanics are a bit stiff in this game, but eventually you should be able to get a feel for the game's mechanics. Holding down the cursor key down will make Freddy move faster. The same thing happens with an analog joystick no matter how far from the center the stick's position is held. 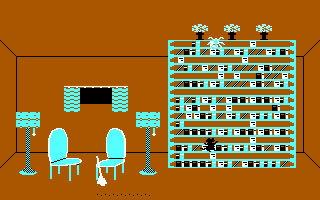 Considering that Alley Cat was originally programmed for the Atari 8-bit computers and their digital joysticks, it is not surprising that there is no real analog joystick support. It seemed to have no problem with a "digital" Gravis Gamepad when run on a real IBM PC. You can "paws the game" by pressing the Escape key. You begin in the alley with three lives and can earn up to an appropriate nine. Your task is to hop on the small or large trash cans, then onto the fence. You can run on top of the fence but not on the clotheslines. You must jump onto the clotheselines where there are clothes hanging off them. From there you can leap or descend into an open window. This screen is the most lethal between the dog patrolling the ground (helped by the other alley cat that pushes you off trash cans) and the things thrown out of windows. You can catch the three mice for points, but they can knock you off a clothesline by touching Freddy as he clings to laundry. The high score is displayed on the left side of the fence and the current score is on the right side of the fence (as telephone numbers) with the number of lives you have remaining. The first room you may enter is the Aquarium. Your first task is to hop into the bowl by touching it. Then the screen will change to Freddy swimming in the bowl. He needs to catch all twelve fish without touching the increasing number of electric eels or suffocating. Freddy and the screen border will change color as his oxygen runs out. You can replenish your air supply by swimming to the surface. The second room is the Pantry. Here there is a huge wedge of cheese with multiple holes. You have to catch four mice in this stage. 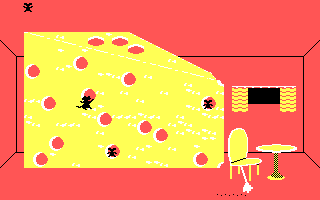 You can jump across the cheese or use the action button to crawl between holes in the cheese. The third room is the Aviary. Here you must knock the bird cage off the table by touching it several times. Once the bird cage falls to the floor, it will break and a bird will fly out. Catch the bird to complete the challenge. The fourth room is the Library. Here you must collect all three flower plants on top of the bookshelf without touching the two spiders. The fifth room is the Kennel. 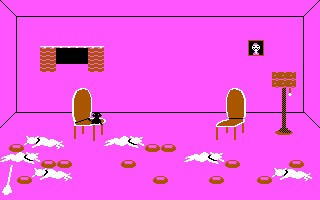 Here you must drink all the dogs' water bowls (twelve in all) with the action button without waking up the dogs. You only have a certain amount of time to drink bows next to a dog before he wakes up. The screen will flash red when one starts to wake up and if he does wake up, he will attack you like the dog in the alley. In each of these rooms is a mad housekeeping broom that will chase you and fling you about the room with contact. It will also sweep up your paw prints, which you can use to distract it. Sometimes, it is helpful to propel Freddy to a hard to reach area. 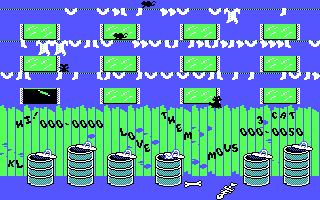 In each of these challenge rooms, the dog from the alley can run across the screen and the consequences are identical as if you encountered him in the alley. You can jump out of the window from which you entered, which causes you to lose the challenge room and return to the alley. You earn points depending on how quickly you completed the challenge room, and on the score screen the background and border will flash green. Felicia's room is a little different. No dogs or broomsticks here. However, there are six levels between you and her, and each one is patrolled by one of her feline siblings who will knock you down to the level below. 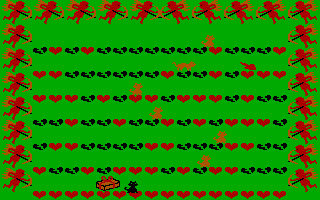 Moreover, the cupids shoot arrows that can turn parts of the floor solid or allow you to fall. If you fall off the lowest level, you lose and must complete a challenge room before you can get to Felicia's room again. When you enter Felicia's room, you will find one present for each time you have tried the room. If you drop this present and one of her cat brothers touch it, it will leave the room. The black colored objects and border will change to blue when you have a present. All the colors change if you get to kiss Felicia. If you kiss Felicia you will get a bonus depending on how fast you cleared the level and may also earn extra lives. 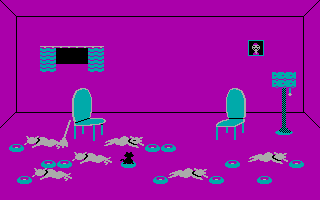 You will not lose a life if you fall off the fence, get knocked off a clothesline by a mouse, fall off a clothesline and go behind the fence, jump into the window from whence you came after entering a room or falling below the lowest level in Felicia's room. You will lose a life if you get hit by an object thrown out of a window, being touched by an awake dog, an electric eel, a spider or drowning in the fish bowl. Alley Cat is a very fun game, one you can or could have found yourself losing half an hour of time (when you should be working). The challenge rooms are fun without getting too frustrating at the lower levels. The graphics are cute and clear, the sound effects are quite appropriately done for the PC speaker. Getting the noise sound effect when the dog attacks you is pretty impressive. This game was a product of its time when character control was seen as part of the challenge, but the jumping control is still on par with Mario Bros. It proves that fast paced, engaging arcade-style games are quite possible on the limited graphics and sound capabilities of the PC speaker. Many other games from the IBM-dominated PC era (1981-1986) will fail when run at a playable on hardware substantially faster than that in the IBM PC. One of the most interesting things about Alley Cat for the IBM PC is that it is very speed friendly when it comes to faster machines, something very rare in its day. However, this is not quite as forward thinking as you may believe. When this port was released in 1984, IBM had no less than three speed classes of PCs on the market during that year. First there was the 8088 running at 4.77MHz running in the IBM PC, IBM PC/XT and IBM PC Portable. Second was the PCjr., which had the same CPU and ran it at the same speed as the PC, but system is slower with 128KB due to the sharing of the memory between the CPU and PCjr. graphics adapter. Third was the IBM PC AT with a 80286 CPU running at 6MHz and up to three times as fast as the IBM PC. The developer probably had to sign a few non-disclosure agreements and put up with the legendary IBM secrecy in order to gain access to that information or hardware, since the AT was not released until August of 1984 and was incredibly expensive when first released. The result is a same that runs at a consistent speed regardless of the hardware being used to run it. It does a speed test prior to loading and uses it to adjust its timing appropriately. 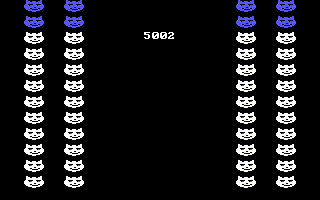 On any system other than a PCjr., Alley Cat is displayed using CGA color limitations. 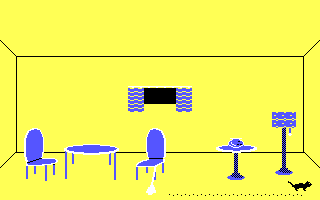 Alley Cat has better color selections and some 3-voice music when run on an IBM PCjr. However, this information had to be re-discovered at some point during the 2000s, Alley Cat has some support of PCjr. graphics and sound. There is three voice PCjr. sound chip music on the title screen. (The PCjr. can play the PC speaker music by selecting N for the prompt "Are you using a TV or an external speaker (Y/N)?") However, all in-game music and sound effects use the PC speaker with the PCjr. 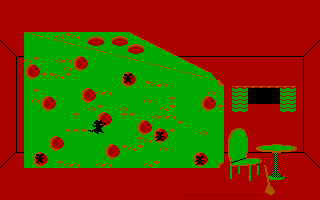 For graphics, as with the CGA card, only four colors are used. However, the PCjr. allows the colors to be selected freely from its 16 color palette. 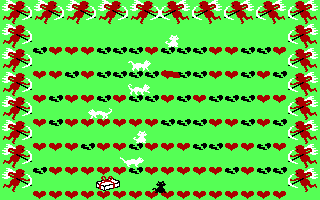 Of course this is not a patch on the Atari 8-bit plaform, which could display 16 colors from a 256 color palette, and on some screens even more can be seen because Alley Cat uses scanline interrupts. You can see differences in the screenshots posted throughout this blog entry. CGA screenshots are on the left side of the page, PCjr. screenshots are on the right side of the page. Outside the PCjr., all later graphics cards should display the colors and effects correctly. 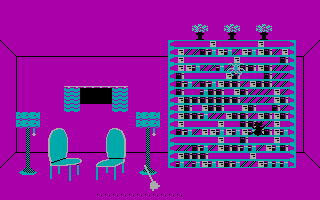 Alley Cat strove for compatibility by avoiding direct hardware access to the CGA card and instead used BIOS functions for its graphics control. All other graphics cards except for Hercules monochrome are or should be CGA compatible at the BIOS level. The BIOS functions are more limited than direct hardware access; BIOS functions only allow the programmer to change the palette color in 320x200 Mode 4 to either green/red/brown or cyan/magenta/light gray and to set the background and border color. It does not allow you to change the palette intensity and emulation of BIOS functions after the Tandy Graphics Adapter tend not to allow you to show the alternate cyan/red/white palette by selectiong 320x200 Mode 5 (which is a side-effect of how the color palettes work on the CGA card). Many other games write to the CGA registers directly to change modes and colors displayed by the card and these tend to fail on the PCjr. and graphics adapters more advanced than Tandy's. 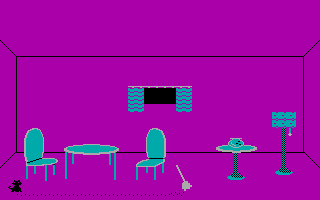 Some cards may show this game using the intense versions of the standard CGA palettes, but you should see both palettes employed. I have been fascinated by the concept of Kickstarters geared to classic video game consoles and home computers. That many have been successful indicates that there are needs that are waiting to be fulfilled. However, most retro video game Kickstarter campaigns have had reasonable goals. Few that have required over $100,000 to be funded have been successful. In this blog entry I will talk about some of the campaigns and give my thoughts on their significance. First, Kickstarter campaigns with lofty goals targeting the retro video game market will almost certainly fail. The Retro VGS is a perfect example of a campaign so wrong headed and just plain bizarre that it justifies the trope "truth is stranger than fiction:". They wanted $2,950,000 to fund a new retro-style cartridge only console built from a plastic mold for the Atari Jaguar shell. Oh, it may have had an FPGA that could recreate consoles like the NES or the 2600 in hardware. The Retro VGS campaign's risible failure has been commented to death and has really given far too much attention. People may be more hesitant to spend their money for big ticket video game projects thanks to the failure of the Ouya console. The Ouya raised over $8 million on Kickstarter for a $99 game console (the controller was quite a bit extra) that would play games easily ported from Android. Despite the massive success of the crowdfunding campaign, the Ouya was sold off to Razer and discontinued within two years of its release. There have been successes with sequels to classic games. Wasteland 2, Dreamfall Chapters, Leisure Suit Larry Reloaded (a remake), Shadowrun Hong Kong and Shenmue III may never had been possible without crowdfunding. Also, some designers with classics to their name like Richard Garriott, Chris Roberts, Tim Shafer, Kenji Inafune and Koji Igarashi have found the resources to back new projects in the vein of their earlier work but which is owned by a large corporation that has turned its back on them. (Hideo Kojima may be joining them soon.) These games of course are designed to play on current platforms. Crowdfunding true retro games designed to be played on classic consoles is a far greater challenge. Similarly, while there have been successful crowdfunding campaigns for books, documentaries and music albums related to classic video game consoles or home computers, crowdfunding useful hardware for those computers and consoles has been a task that has been a success only to a few. The NES has had a quite a few successful hardware and software kickstarters. Hardware successes include the Blinking Light Win : https://www.kickstarter.com/projects/113891498/blinking-light-win-resurrecting-your-nes?ref=discovery For $20 you bought a quality NES cartridge connector replacement that, eleven months after the campaign has ended, they are still having trouble stocking. It has fulfilled a need for a reasonably priced, quality connector from people who are passionate about what they are doing, not just some Chinese manufacturer endlessly recycling second-rate parts. There has also been the Chip Maestro, a MIDI synthesizer device that uses the audio channels of the NES' 2A03 APU : https://www.kickstarter.com/projects/jarek/chip-maestro-an-nes-midi-synthesizer-cartridge?ref=discovery This is not the first cartridge to allow for the NES audio channels to be controlled via MIDI, the MIDINES was available years earlier, but may no longer be available for purchase. While you may ask why you need a MIDI controller for the NES when you have FamiTracker and other musical composition programs that allow for full register access to the APU, if you want to use a keyboard directly with the NES in a live performance, you need something that will respond to key presses in real time, hence these MIDI controllers. Cheetamen II: The Lost Levels (essentially a fixed version of Cheetamen II on a cartridge) is the most successful NES-based hardware Kickstarter I know of : https://www.kickstarter.com/projects/343248998/cheetahmen-ii-the-lost-levels?ref=discovery There is a patch available for the game here : http://www.romhacking.net/hacks/778/ that allows you to complete the game and you can play it on an NES PowerPak and an EverDrive N8 with the MMC1 patch. Despite the full ALL CAPS and somewhat discursive presentation, the Kickstarter was a huge success. This must have been helped by the large number of NES collectors who wanted to fill a hole in their collection for $60 instead of $1,000, which is what the original Cheetamen II cartridge was going for at the time. The promotional video with James Rofle in his Angry Video Game Nerd persona (and his 1.95 million subscribers) must have helped enormously. Another modestly successful piece of NES software is the retroplayer.nl Championships 2015, which recreates the Nintendo World Championships 1990 cartridge and competition : https://www.kickstarter.com/projects/1348643050/nintendo-nes-retroplayernl-championship-2015?ref=discovery Frankly I do not know how this got through Kickstarter because it uses Chip 'N Dale's Rescue Rangers II, Tetris and Excitebike and no authorization from any of those rights holders seemed forthcoming. Considering that it flew well under the radar, no one may have brought it to their attention. The book is being published alongside a game exclusive to the kickstarter called Jeffrey Wittenhagen's Black Box Challenge. It is being programmed by Sly Dog Studios, no stranger to NES homebrew. Whether their games are any good I cannot say but graphically they look pretty dull. This game is an RPG centered around the quest to acquire all NES black-box games. This campaign requested $15,000 and took in $24,455. If you wanted a physical paperback copy of the book and the game on cartridge without box or manual, you would have to pledge $90. For a more impressive hardcover copy of the book and a game with box and manual, the price increases to $170. Perhaps the price seemed a bit steep to attract more donors. The second book, the Ultimate Guide to the NES Library by Pat Contri, https://www.kickstarter.com/projects/560468638/nintendo-nes-library-guide-and-review-book-of-750?ref=nav_search gets you a physical hardcover copy of the book for $60. Normally I do not mention books without something else, but this book is the most funded NES project ever, expecting to hit the $100,000 mark. Pat has also had three successful Indiegoogo campaigns for his annual NES charity marathons and has also successfully raised money for four DVD volumes of his Pat the NES Punk series. There is also documentary called The New 8-bit Heroes with a new NES game called Mystic Searches : https://www.kickstarter.com/projects/1316851183/the-new-8-bit-heroes-new-nes-game-and-creation-doc?ref=discovery The documentary is focused on the homebrew scene and the game will be an adventure game that appears to play in the Zelda vein. Also, accessible from the cartridge via a USB port will be a modern version of the game and the NES game and the PC game can talk to each other. Perhaps a bit too ambitious, and the $54,381 pledged is not sufficient for the modern game. Unfortunately, the project manager was required to remove all references to Commodore from his campaign because the entity that holds the Commodore trademark threatened to sue for trademark violation. Fortunately they did not catch it until late in the campaign, so there was sufficient advertisement for the kickstarter to be successful. I understand it is compatible with any C64 motherboard with proper keyboard support mounts, and I have a nice C64 motherboard that works with a brittle, post-retr0bright failure case. Considering that the creator only wanted a modest $10K, obtaining over nine times that amount was pretty impressive! The Commodore Amiga has seen similar success with a project (with their second attempt) to make new A1200 molds : https://www.kickstarter.com/projects/a1200housing/new-amiga-1200-cases-made-from-new-molds?ref=nav_search You will note that the name Commodore is not present when describing the project. Of all the projects discussed here, this one is the only one which has passed the $100K mark. However, the project managers needed to make new molds, which is incredibly expensive. I cannot say I am incredibly familiar with the late model Amiga scene (not a lot of gaming potential there), but boy there had to be a need for these cases. They also have room for a Raspberry Pi or a MiST FPGA board, which would not have been the case with the original cases. which is a HDMI adapter/converter for the original Game Boy. Unfortunately, 65,000 Euro is an ambitious goal and I believe that people were really expecting not just original Game Boy, but Game Boy Color and Game Boy Advance support, especially with the Retron 5 out there. How much more processing power would have been required to convert 15-bit color instead of 2-bit monochrome? Also, the hdmyboy lacked stereo output support. As you can see, this is a very small number of successful projects (14). Most people who have a product usually rely on pre-orders from internet forums like AtariAge, NintendoAge, VOGONS, Vintage Computing Forums, Sega-16, PCenginefx forums or assemblerforums. AtariAge has been extremely successful in allowing developers to publish new games for the Atari 2600 in cartridge form. On the other end of the spectrum, kevtris had to fund development of the Hi Def NES Mod out of his own pocket, for example. Currently, retro console and computer related kickstarters that keep their funding goals within the five figure mark stand a good chance of success. Six figures is most likely poison to just about any campaign. As I am have been playing through Pool of Radiance, I have really come to appreciate its tactical combat and the simple yet intricrate mechanics of a system using the AD&D 1st Edition rules. Of course, not everyone will be able to just simply pick up the game and those that do can be easily frustrated. So I will try to discuss strategies for getting through the game in this post. As I continue to play the game, I hope to be able to expand this blog entry. It will not be a walkthrough or give specifics of how to defeat this encounter or what items to keep from that encounter. For each character you create, you can and should consider maximize their ability scores and hit points. You cannot do this after your start a game, and you will need all the advantages you can get to survive the low levels. You cannot maximize their starting gold, so you should reroll until you get a good result. Fighters can start with up to 200gp, clerics 180gp, thieves 120gp and magic-users 80gp. Multi-class characters are a defensible choice if all you want to do is beat Pool of Radiance, but you will level up a bit more slowly. If you want to get through the whole tetralogy, you will want single-class characters to avoid level limits. This means a human party. Thieves have no level limits regardless of class, so a fighter/thief is a more justifiable choice than other multi-class characters. However, multi-class characters have to split their experience between their classes, even if they can no longer progress in one of them, so your characters will gain levels more slowly than a single class character. They also must adhere to certain restrictions of each class. Finally, multi-classes halve the HP they receive when they level up, so a level 2 fighter/thief can have a maximum of 16HP as opposed to 20HP for a single class fighter. All non-human races should have benefits, unfortunately it is often difficult to tell whether they were implemented in the game. . Elves get a +1 to hit with short and long swords and bows. Elves may be immune to Ghoul paralysis. Elves should also have 90% resistance to sleep and charm spells. Half-elves should have a 30% resistance. Elves and half-elves should also have a better chance of finding hidden objects. Dwarves should get a bonus of up to +5 to their saving throws against wands, staves and spells and poison, based on their Constitution. They also should get a +1 to hit against goblins, hobgoblins and orcs and ogres, trolls and giants should have a -4 to hit them. Gnomes should also receive the same benefit to their wands, staves and spells saving throws as dwarves have. They should get a +1 against Kobolds and Goblins and gnolls, bugears, ogres, trolls and giants should have a -4 to hit them. Halflings should also receive the same benefit to their wands, staves and spells and poison saving throws as dwarves have. Walls and trees can be vital to your party's survival. When outnumbered by enemies that are not significantly weaker than you are, you should maneuver your party to take maximum advantage of impassable objects. You can limit the number enemies that can hit you by utilizing choke points. Monsters cannot move past each other if there is no room. With monsters that take up two or four squares, you can often maneuver them so that one will block the rest, allowing your characters to concentrate their attacks on one character. In fig. 1, the party is at a disadvantage because eight orcs can attack the characters. Fig. 2 may show an improvement because now only four orcs can attack, but the clerics cannot attack back. Fig. 3 improves on the situation of Fig. 2, now only the two fighters and the two orcs can attack each other. Fig. 4 shows the best situation, all four characters can attack, but only two orcs can attack. Note that walls in this game may only take one tile but effectively create a double wall at a horizontal gap. Even if the enemy is not a thief, you do not want to be attacked from behind. The enemy will enjoy a +2 to hit if it attacks your character from behind. Staggering your characters diagonally gives the enemy more opportunities to attack, but it also gives you more holes to place attackers. Having a straight line does the opposite. Having missile weapon using characters behind the front lines can thin out the opposition before they can even get a chance to attack. You can also kill enemy archers and spellcasters from a distance. The pathfinding in Pool is decent, but it has its limitations. If you have an L-shaped or U-shaped barrier between you and the enemy you may be able to get the enemy trapped behind it as the pathfinding algorithm fails to find a path it can use to get to attack your character. Guarding is the classic way of having a character do nothing during his portion of the combat round. However, it can also be a useful defensive mechanism. If an enemy advances into the character's melee range, the character gets a free and automatic attack. Additionally, if an enemy tries to retreat or move past your character, your character will get a free attack on that enemy. The enemy can also do this if you move into or out of his melee range. However, if you move into his range before he has a chance to guard, then you will not risk a free hit. In this game, you do not always need to kill every enemy faced against you. Typically, once you reduce their numbers sufficiently, often the survivors of the monsters will surrender. You won't get the experience or treasure from killing them, but this will end a battle sooner than otherwise. Some monsters like the undead are fanatical and will always fight to the last creature. However, you may be able to do enough damage to a horde that it will surrender even though it still has the advantage of numbers. Unfortunately, you cannot surrender once combat starts. If you feel like you are getting overwhelmed, you may turn your back and flee to the edge of the map. Depending on how many and how far the enemy is behind you, you may not be able to escape when you reach the edge. Also, if you are engaged in melee combat you will invite multiple rear attacks as you move. If you leave a dying character behind when you escape, that character will be dead and lost forever. Thieves are limited to slings and magic-users to darts. Slings have unlimited ammo, darts do not. Slings can do decent damage and have good range. Darts are weak and have a short range. A pure magic-user has a very low THAC0, so the darts may not seem worth the trouble considering how often the magic-user will miss. Clerics cannot use missile weapons at all in Pool. Bows can fire twice per round and darts can fire three times per round. Long bows have a longer range than short bows, but do the same amount of damage. If you encounter monsters and are able to select the Advance option, you may wish to consider starting combat immediately. This way you will have a fair distance between you and the monsters. This could give you one or two rounds where you may be able to attack with missile weapons and the enemy will be unable to respond. The game will allow you to Ready a new weapon every combat round without penalty. So you can shoot your bow until the enemy comes within melee range and then switch to your melee weapon and armor and attack that round. An unamored character has an Armor Class (AC) of 10, and the lower the number, the better protected your character will be. For your front line fighters, it is essential to maximize their AC if they are to survive. This means plate armor and a shield and high dexterity. At the beginning of the game, you won't be able to afford plate, so you will have to make do with chain or split or banded mail. Even so, your fighters can start the game with a -1 AC, which will make many hits miss. You lose the ability to use a shield with a two handed weapon, but a lower rate of being hit is a worthy trade off for the few extra points of damage you may inflict. In the early part of the game, you should have fighters with a high strength score and you will be facing tons of Orcs, Goblins, Kobolds and the like which tend to overwhelm by numbers. The more attacks you dodge, the longer you will last. So I would not seek out two handed weapons until you start to find magical weapons. THAC0 is affected mainly by strength and class. All 1st level classes have a THAC0 of 20. This means that you must roll a 20 on a (virtual) 20 sided die to score a hit on an enemy with an armor class of 0. Male Human Fighters can immediately lower that score to 17 by the maximum exceptional strength score of 18/00. In this game, regular Kobolds are probably the weakest enemies, with 3 HP and an AC of 7. With a THAC0 of 17, which is the maximum you can have at the beginning of the game, you will be able to hit a Kobold only 55% of the time. The hit percentage gets lower for Goblins, Orcs, Skeletons and Zombies. Unless you find some magic weapons, your THAC0 will not improve until your character is at least at level 3. Fighters acquire the ability to sweep at the 2nd level. This allows them to attack more than one enemy in melee range with less than one hit die in a single attack. So if a fighter is surrounded by Goblins or Kobolds, he can attack as many of them as he has experience levels. Fighters can achieve up to level 8 and gain 1-10HP per level. They can use any type of weapon, armor or shield. They will also gain an extra half of an attack at level 7. Clerics can only use clubs, flail, hammer, mace and staff for a weapon. Flails are the best, followed by maces. They can use any type of armor and can use a shield. Clerics can only reach level 6 in this game and 3rd level spells. They gain 1-8HP per level. They can Turn Undead, which if successful will make some of or all the undead flee, making the job of killing them safer if more tedious. They can turn Skeletons, Zombies, Ghouls and Wights at level 1, Wraiths at level 3, Mummies and level 4, Spectres at level 5 and Vampires at level 6. As they level up, the turning will become more likely to be successful. Wights, Wraiths, Spectres and Vampires will cause a level drain with a successful attack, so you want to turn them as soon as possible. If you lose a level to level drain, you cannot get it restored at a temple, you have to earn the level again or find some restoration scrolls. Even so, the loss of XP can be very painful. For 1st level spells, Cure Light Wounds is a must, it is the only healing spell a PC cleric can cast in the game. Bless is also a good spell because it improves the THAC0 of everybody in your party by 1. Hold Person is the best 2nd level spell because you can target up to three enemies with each casting of the spell. A held person can be killed with one cruel blow and the attack is an automatic hit. Slow Poison may be necessary when fighting poisonous creatures. You cannot cast Neutralize Poison in this game. Prayer is probably the best 3rd level spell. it is a combination of Bless and Curse. Magic-users start the game with four spells, read magic, detect magic, shield and sleep. Each time they gain a level, they can learn one extra spell from any spell level they can cast, but only one spell can be added this way. 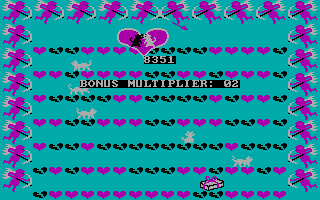 Magic-users can only reach level 6 in this game and 3rd level spells. They only gain 1-4HP per level. At level 3 you can begin to cast 2nd level spells and at level 5 you can cast 3rd level spells. I would suggest learning Magic Missile, Stinking Cloud, Mirror Image, Fireball and Haste. Magic-users can only use daggers, darts or staffs and can wear no armor and use no shields, so look for bracers of defense. Because of the hordes of opponents you will seemingly encounter in every battle, area effect spells are usually more useful than single-target spells. Sleep is the best level 1 spell because, like Hold Person, it allows you to kill an enemy with a single cruel blow. However, no saving throw is allowed, and it can affect up to 16 monsters. Kobolds, Goblins, Orcs, Hobgoblins, Gnolls, Lizardmen and even an Ogre may be affected. It can affect your characters as well as the enemy, so make sure you do not target the spell at an enemy within a character's melee range. Anchor the spell to an enemy behind the attacker. Thieves can use clubs, daggers, darts, slings, short swords, scimitars, long swords and broad swords. They can only wear leather armor but cannot use a shield. Thieves can achieve up to level 9 and gain 1-6HP per level. If a thief successfully hits with a back stab attack, he does double damage at levels 1-4, triple damage from levels 5-8 and quadruple damage at level 9. A thief gets a +4 to hit with a back stab attack. A thief can only backstab an opponent already being attacked. He must attack in the opposite direction from the opponent's first attacker. More importantly, to avoid a monster turning toward the thief and ruining the backstab, make sure that the monster has attacked before the thief does. The only thief abilities used in this game are the pick lock, find and remove trap and climb wall abilities. What you can pick you can usually bash with a strong fighter and there are not an overabundance of traps in this game. Climb walls may be used once or twice. You can have six characters you directly control in your party and up to two NPCs or charmed or summoned monsters. Every party should have two front line fighters, two healers, a character with thief abilities and at least one magic-user. I have no love for hired NPCs, they cost money to hire, they take an automatic cut of all treasure, you cannot control them in combat and they do not like to give up items. There are some NPCs that will assist you on a single mission, but that is plot related. This game comes with a Rule Book, an Adventurer's Journal, a Quick Reference Card and a Codewheel. The Adventurer's Journal contains the Proclamations, Tavern Tales and Journal Entries, maps and some tables. You will need the Codewheel to translate some elven or dwarven runes at least at one point during the game. Even if you crack the copy protection you should still keep it handy. If you want to know more about the probable game mechanics, you should have your three volume set of AD&D 1st Edition rulebooks at your disposal. You can find all the rules and tables not explicitly mentioned in the Pool materials there. They can be relied upon except where contradicted by the Pool materials or when its obvious that the game does not implement the rules. You can find more complete statistics for the monsters in the Monster Manual or the Dungeon Master's Guide with a few exceptions. Statistics for the Drider, Mantis, Quickling, Thri-kreen can be found in the Monster Manual II. The other 1st Edition Rulebooks do not appear to be used in Pool.